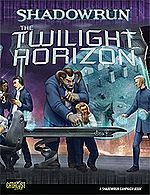 The Twilight Horizon ist ein Kampagnenband für die vierte Edition von Shadowrun. Er führt die Plotstränge aus der dreiteiligen "Horizon Adventure"-Kampagne zusammen, und enthüllt die Schattenseiten und unangenehmen Wahrheiten hinter der - vielfach als "guter Konzern" wahrgenommenen - Horizon Group. Zusätzlich liefert "The Twilight Horizon" noch einige Informationen zu Las Vegas als Setting für Shadowrun in den 2070ern. Der Kampagnenband wurde im März 2012 in englischer Sprache von Catalyst Game Labs veröffentlicht. The Horizon Corporation is everywhere. They’re in the trids you watch, the music you listen to, and the news you consume. They’re propping up hundreds of major brands of products across the planet with their public relations skill. And they’re spending countless hours studying how you — that’s right, you — think so that they can lead your mind like a master leads a spaniel. Denizens of the Sixth World have long suspected that there is a dark side to Horizon, if only because the corporation seemed too good to be true. If there is a dark side, it seems likely to come out soon, as the corporation has been under tremendous pressure recently — technomancers are plotting against it, spirits are causing problems in the Mojave, and Aztechnology is on the offensive, intent on keeping the competition down. That pressure is going to result in an explosion somewhere, and when it does, Horizon and the Sixth World will be changed forever. FRIENDS IN THE RIGHT PLACES. THE HEART OF THE HEAD. Diese Seite wurde zuletzt am 15. Juni 2013 um 05:33 Uhr geändert.